I LOVE the Greenbrier! It has so many of the things I love rolled into one location: history, southern hospitality, beauty, relaxation and yummy food! I mean, how could you not love this place?! Let’s start with the history. The Greenbrier is an award-winning resort located in White Sulphur Springs, West Virginia. 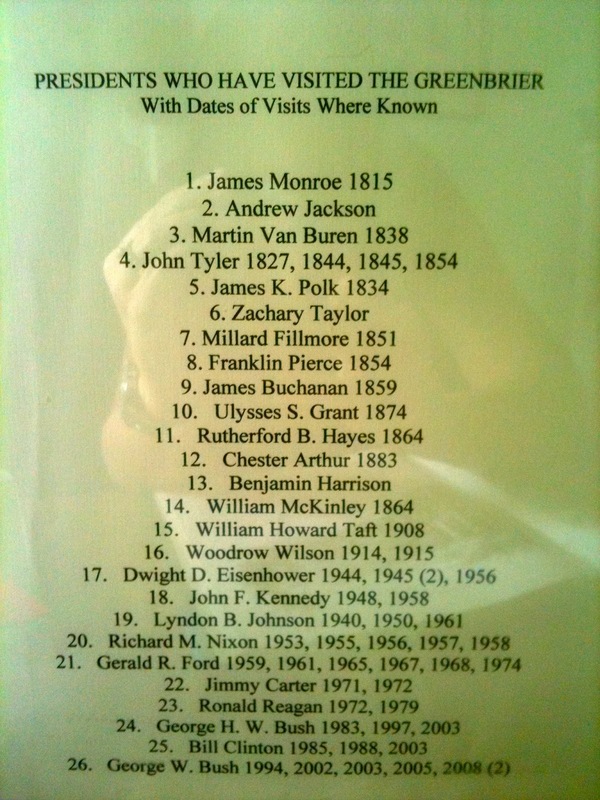 It is a National Historic landmark, that has hosted distinguished guests from around the world since 1778. Yes, I said 1778! The story of The Greenbrier begins at the sulphur water spring that remains the center of the resort property. The spring sits below the Springhouse that serves as The Greenbrier’s symbol. As I said, since 1778, people have come to “take in the waters” in order to restore their health. In the 19th century, visitors drank and bathed in the sulphur water to cure everything from rheumatism to an upset stomach. Because of the water’s draw, the resort was known as White Sulphur Springs. Some of it’s historical highlights include: During the Civil War, both sides occupied the grounds using the hotel either as a hospital or military headquarters; It was used during WW2 for several things, including a hospital; It was decorated by Dorothy Draper in late 40’s; Sam Snead was the golf pro there; it held the Emergency Relocation Center-a bunker or bomb shelter-to be occupied by the U.S. Congress in case of war, that you can now tour; And it has been visited by at least 26 Presidents! For more details on the history of the Greenbrier click here. The location in the Appalachian Mountains is beautiful. Also notice the Springhouse with the green dome. This is the symbol of the Greenbrier. 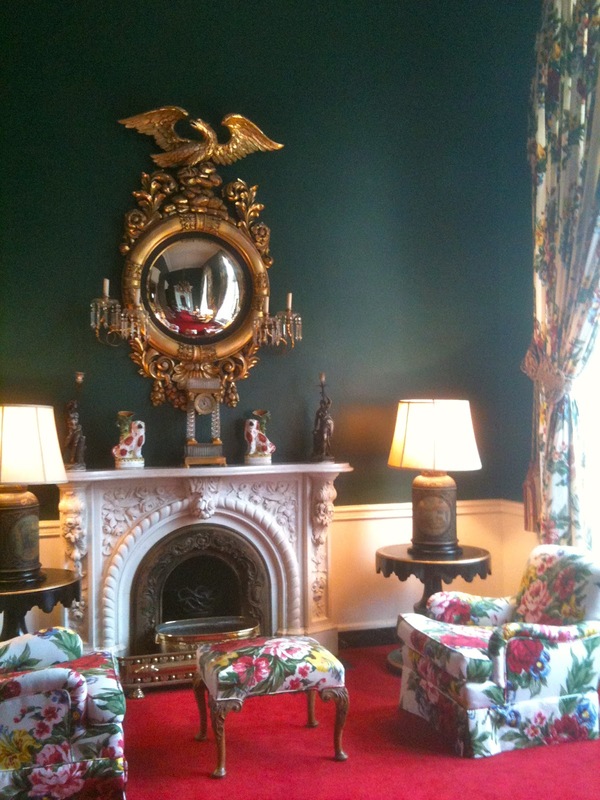 The decor of the Greenbrier is over the top in every way, but I love it! Would I ever decorate my home like that? No! But I love the fact that it is the only place I have ever been to that is decorated this way. I would be really sad if it ever changed. The decor is part of its charm and history. These first two pictures are of the different rooms I have stayed in. Nobody will ever say that the Greenbrier lacks color! 🙂 The rooms are very comfortable and spacious. Some of the bathrooms have bidets. You do have to remember the age of the hotel. But even keeping that in mind, I think the rooms are great. The hotel is rather large and they offer TONS of options for lodging, including cabins and other things on the property. Here is a link for that. Besides the numerous room options, there are several spots in the Greenbrier for hanging out, having tea or some great cocktail or even reading a book. One of my favorites is below next to the fireplace. Every morning they serve coffee or tea near here and I would relax, drink my tea and plan what I was going to do for the day. There are so many activities at the Greenbrier, including bunker tours, swimming (indoor or out), shopping, falconry, bowling, tennis, golf, fishing, hiking and much more. But my favorite is the spa! I try to schedule something for every day I am there. My favorite is The Greenbrier Treatment, it begins with a sulphur soak, followed by a steam or sauna. Then a Swiss Shower and Scotch Spray break up toxins and cellular blockage in the body. And it ends with a full body massage. Awesome! You can use the steam sauna and the dry heat sauna before or after your treatments. Plus you get to relax in the relaxation area with tea, water and snacks. It makes for an amazing day! 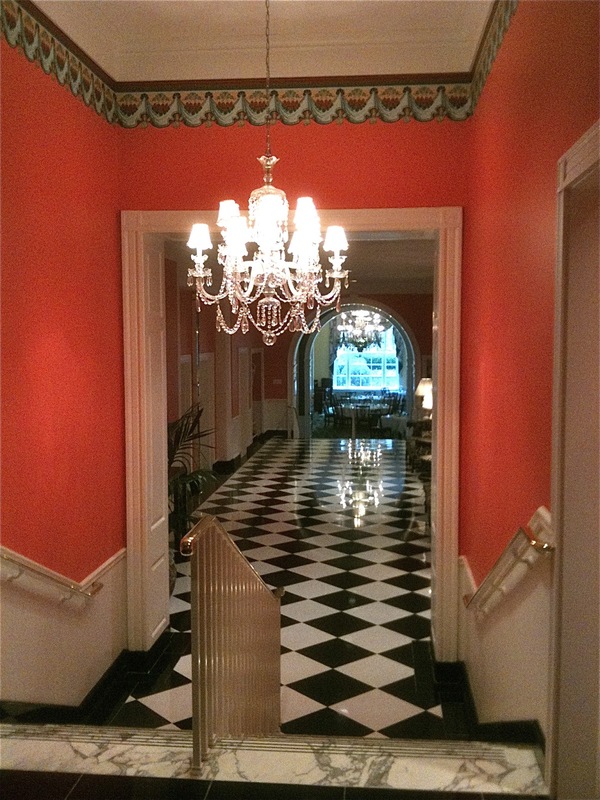 Sometimes when I visit places, I try to imagine what it was like when earlier guests visited, but at the Greenbrier, I can experience that for myself. I LOVE that! I've always wanted to go to the Greenbrier. After reading this, I will definitely have to schedule a trip! I highly recommend it! One of my favorite places to go to escape reality. Must cost a fortune, but it looks fabulous!! While there are some accommodations that are pricey, there are others that are very reasonable. No more than any other nice resort. In fact, less than what I will be paying at Disney this summer. I'm going to be going again soon and doing more detailed blog posts on it. Can't wait to share. I think I've seen the Greenbrier on the Bachelor one season? It looks spectacular! What a gorgeous place to stay! That's cool! It is a spectacular and gorgeous! So excited to be going back soon! It The Greenbrier looks charming and is a fairly short drive from my Ohio home. I'd love to run down for the weekend just for a tour! Beautiful! I love the history behind it- how fascinating that it was occupied by both the Union and Confederate Armies! Thanks for linking up to the Best of the USA blog hop. I was really upset to see that none of the links showed up right away. I did fix it and will be promoting your post. So sorry! You should check out the Greenbrier sometime. Amazing place!